Source: Produced in E. coli. Human BAG-1S is fused at the N-terminus to a GST and His-tag. Formulation: Liquid. In 20mM TRIS-HCl, pH 8.0, containing 300mM sodium chloride, 0.2mM magnesium chloride, and 1% glycerol. Scientific Background: BAG-1 is a Bcl-2-binding protein which lacks sequence homology with Bcl-2 and its related proteins, and functions to enhance the anti-apoptotic effects of Bcl-2. BAG-1 is expressed as three major functionally distinct and differentially localized isoforms, which originate from a single mRNA. BAG-1S, 36 kDa, typically found in cytoplasm, generally the most abundant isoform in normal cells; BAG-1M, 46 kDa, found in both the nucleus and cytoplasm and under certain conditions, it can translocate from cytoplasm to nucleus; and BAG-1L, 50 kDa, nuclear localized, involved in regulating transcription. BAG-1 binds to the intracellular domain of the hepatocyte growth factor (HGF) and platelet-derived growth factor (PDGF) receptors, enhancing growth factor mediated protection from apoptosis. BAG-1 binds to the ATPase domain of Hsc70/Hsp70 to modulate its chaperone activity, in-part regulating Raf-1 activity and the assembly of glucocorticoid receptors. 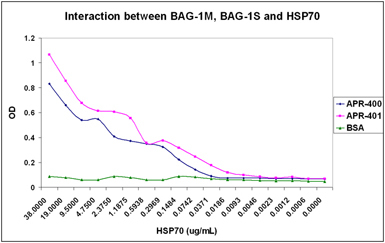 ELISA analysis of interaction between BAG-1M (human), (recombinant) (His-tag) (Prod. No. ADI-APR-400), BAG-1S (human), (recombinant) (His-tag) (GST-tag) (Prod. No. ADI-APR-401) and HSP70 (Prod. No. ADI-ESP-555). 2-Fold serial dilution of HSP70 from 38 μg/ml down to 0.58 ng/ml was incubated with plate pre-coated with 10μg of BAG-1M, BAG-1S or BSA. 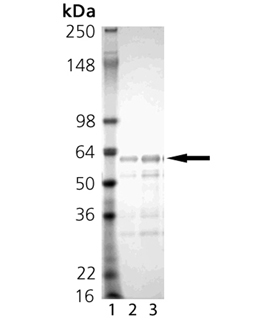 Bound HSP70 was probed with HSP70 mAb (Prod. No. ADI-SPA-810) followed by goat anti-mouse IgG, HRP-conjugated (Prod. No. ADI-SAB-100), and detected by TMB. Western Blot analysis: Lane 1: MW marker, Lane 2: BAG-1M (human), (recombinant) (His-tag) (Prod. No. ADI-APR-400), Lane 3: BAG-1S (human), (recombinant) (His-tag) (GST-tag) (Prod. No. ADI-APR-401) probed with BAG-1, pAb (Prod. No. ADI-905-735). SDS-PAGE analysis of BAG-1S (human), (recombinant) (His-tag) (Prod. No. ADI-APR-401): Lane 1: MW marker, Lane 2: 0.5μg, Lane 3: 1μg BAG-1S. 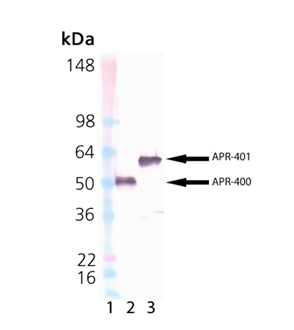 Low endotoxin HSP70 recombinant protein.